Below is a list of upcoming events that Otterbourne Brass are hosting or playing at. If you would like to receive email invitations to our ticketed events, please sign up to our mailing list. £8 per ticket, 10% discount for groups of 8 or more. To buy online, visit Eventbrite to buy an eTicket and show it to us on your smartphone. We will have your name on a list when you arrive. Call or email now to reserve tickets for payment on the door! Otterbourne Brass are once again playing at the Otterbourne Fete and Jalopies, hosted by St Matthew's Church. The jalopies, handmade by the children of Otterbourne together with their families, will begin parading from St Matthews Church at around 1:30pm, entering Oakwood Park Recreation Ground at around 2pm, and played onto the ground by Otterbourne Brass. At the fete there will be a variety of stalls, games, a selection of food, the miniature railway, and entertainment in the centre square including fancy dress and dog competitions. Please note: Otterbourne Main Road will close at 1:30pm to allow the Jalopy Parade to begin, so to avoid disappointment, arrive early. Parking is in nearby roads. If you would like to be kept informed about all other Otterbourne Brass events, please sign up to our mailing list. 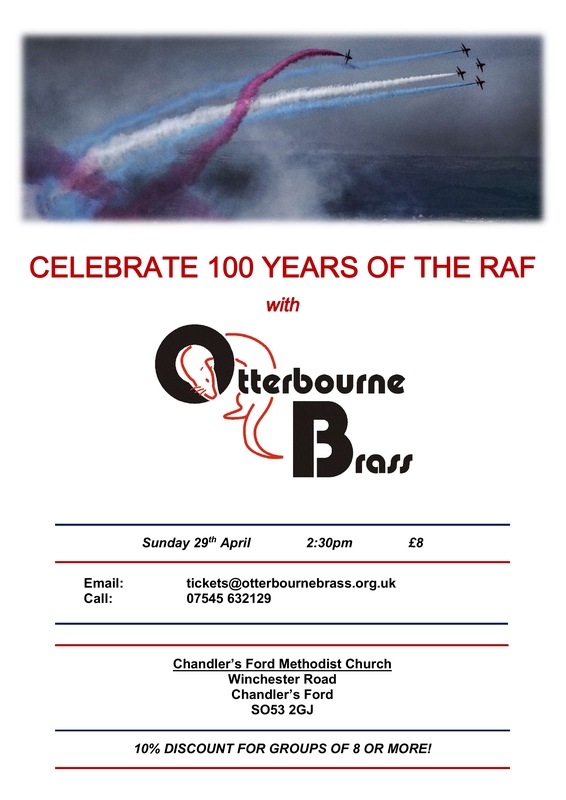 Otterbourne Brass presents a Celebration of 100 Years of the RAF. 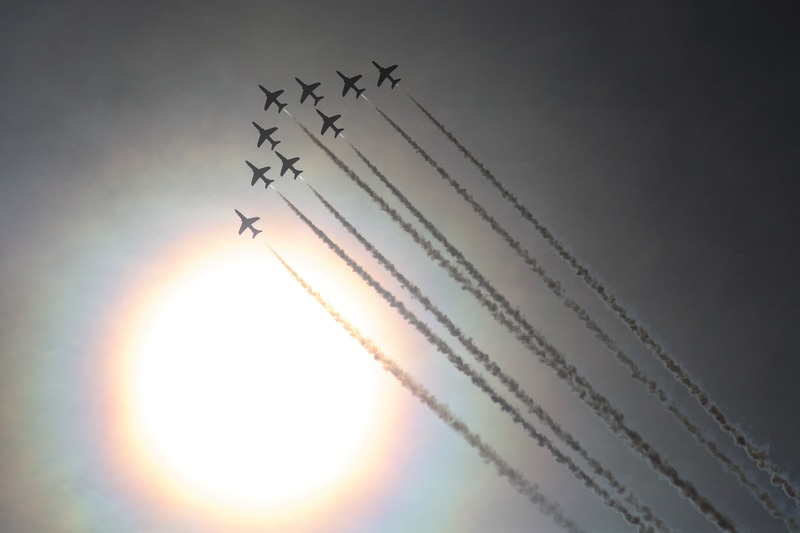 With the centenary of the RAF in April 2018, Otterbourne Brass would like to invite you to celebrate with them through a variety of military music and nostalgic tunes, interspersed with a showcase of our solo players. Price: £8 per ticket / £5 for Under-16s. Please note: We will not be sending tickets out for this concert - rather, we will reserve your name on the guest list and hold a programme for you at the door. All cheques payable to Otterbourne Brass. A showcase of traditional British pomp and circumstance, interspersed with fantastic pieces and sublime solos. Tickets are on sale through Eventbrite, or download our LNOTP Booking Form. If you would like to be kept informed when the tickets are on sale, and for all other Otterbourne Brass events, please sign up to our mailing list. Otterbourne Brass performs two concerts (we're so popular that one is not enough!) to celebrate the Festive season, on Saturday 8th December at 2.30pm and then again at 7.30pm. 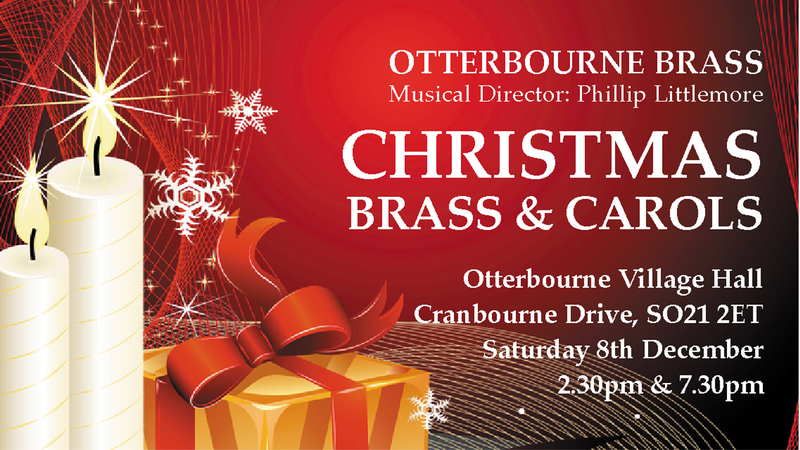 For those that cannot get enough of Christmas - and, more importantly, Otterbourne Brass - you will be delighted to know that the programme for each concert will be different. So why not buy a couple of tickets for each? You will not be disappointed! Not only is there an opportunity to show off your own vocal talents with some choice carolling, but you will also be able to hear some of the great classic songs performed by our chosen soloists. We will be performing music from some of the most popular Christmas films and music from films often shown on TV at Christmas. Don't miss out! Get your tickets early. We're expecting a sell-out for both! Print the attached booking form and return to the postal address with payment. Alternatively to request a booking form in the post, call Otterbourne Brass on 07842 482862 or Mrs Mary Davis on 01962 711998. If no answer, please leave a message with your name and full address including postcode. Itchen Valley Country Park will be holding a Festive Crafts and Carols event on Saturday 15th December. The Craft workshop is from 12.30 til 2.30, followed by our carols from 3pm til 4pm. Listen to our festive sounds as you do your weekly shopping. Come and listen to some of your favourite Christmas Carols on Winchester High Street. Take a few minutes out of your hectic morning. You made it! You're here. Give yourself a chance to relax and think about which shop you need first, and while you wait, we'll help you get into the Christmas spirit again. We're helping you to get into the Christmas spirit while you madly shop for your forgotten cranberry sauce, goose fat and extra wine bottles! Come and see us on Sunday from 12pm til 2pm at @Sainsburys #BadgerFarm. Take a few minutes out of your hectic evening. You did it! Give yourself a chance to relax and wind down from your mad shopping, and before you head to the car, listen to the soothing sounds of our carol playing.